BrightStar Experts help you maximize the effectiveness of your Oracle Applications with services ranging from discovery and architecture services to upgrades and optimization services. BrightStar provides expertise—paired with comprehensive solution knowledge and tools—to improve business and IT capabilities and accelerate time to value to the next-generation of Oracle applications. BrightStar delivers value across the full solution life-cycle with customer-led engagements, ranging from limited-scope projects to fixed-price, multiple-year projects. Services for Application – BrightStar Enterprise Consulting helps you take maximum advantage of Oracle Applications to enable organizations to make better decisions, reduce costs, and increase performance. + Architecture and Planning Services – Our architects provide expertise across the entire Oracle technology footprint—from applications to systems. For Oracle Applications, our architects offer strategic planning, leading industry practices, application architecture, business use case, business process optimization, and change management solutions for successful business transformation. Expertise includes IT portfolio rationalization, enterprise resource planning, customer experience, and Oracle Fusion Applications. + Implementation Services – application implementation services address the unique complexities of your organization and industry. Implementation offerings are tailored for industry verticals in financial services, healthcare and life sciences, higher education, manufacturing and distribution, retail, communications, and the public sector space. Regardless of your industry, you can achieve superior and predictable business outcomes. + Upgrades – We help you complete your upgrade in the fastest, most economical, lowest-risk manner possible. Experts have combined years of solution expertise to create best-in-class methodologies and tools to simplify the application upgrade process on-premise or in the cloud. + Application Customization – we enable customers to customize application to their needs as per the company business model and help them have look and feel of applications which brings better ROI and user satisfaction. + Optimization – We enable customers to optimize their Oracle solutions in between upgrades by providing a fully tested and documented architecture that’s ideal for upgrading and consolidating Oracle’s integrated suite of global business applications. Our optimization services focus on usability including user experience, process optimization and efficiency, functionality, and performance of your application platform. BrightStar can keep your Oracle Server systems running at their best, delivering maximum Database Performance, Database Security and Database Availability. – to ensure your IT infrastructure is robust to meet business availability requirements and agile to adapt to changing business priorities. – a complete database review, based on proven methodologies and industry best practices, designed to highlight potential issues and ensure systems are robust, secure, scalable and optimally tuned. – using the BrightStar method, based on recognized best practice, from a scoping study through to a complete implementation BrightStar can deliver a solution to meet your business needs based on modern SOA principles. – an inclusive, cost-effective management service for all of your database requirements. The service can be provided on a 24×365 or “Business Day” basis to ensure that performance and up-time are tailored to your organizational needs. The package consists of scheduled services that proactively manage your environment and on-call services to ensure that guaranteed support against service level agreements is delivered. Contact us ( info@bslion.in ) today for a free consultation to discuss your requirements. Oracle Application Express (APEX) is free tool included with every Oracle database for the rapid development of web and mobile applications. BrightStar team can analyze, design and create efficient workflows to build effective applications. We can also host and support your application onsite or cloud based giving you low cost, no hassle workflow application. BrightStar has a team of developers ready to delivery solutions at competitive price using APEX. Oracle APEX is a free a rapid web application development tool of the Oracle Database allowing developers to build data-centric, secure web applications. Easy collaboration within organisation with cloud based application. No more emailing spreadsheets around. Improved data integrity & control. Your data is captured and accessible from a central place. You can decided who can see what using very robust built in authorization schemes. Data is managed and easily shared, which helps in reducing cost of data maintenance. Forms and reports that can be integrated with the Oracle E-Business data schema. Flexible authentication model that can support the E-Business Suite security model. Usage of E-Business Suite menus to link directly to APEX reports and forms. Usage of APEX to call E-Business Suite APIs directly, such as sales order import. Replacement of Oracle Discoverer to provide a better reporting solution. APEX applications are perfect for data centric and departmental solutions with low cost reporting solutions. The framework provides a more robust and scalable architecture than using spreadsheets and faster development than with forms and reports. Our Custom Development consultants merge years of business expertise with the BrightStar Near/Offshore model. This model combines experienced onSite resources and industrialized onShore and offShore development centers which are based out of Eastern Europe (Romania) and India (Pune). 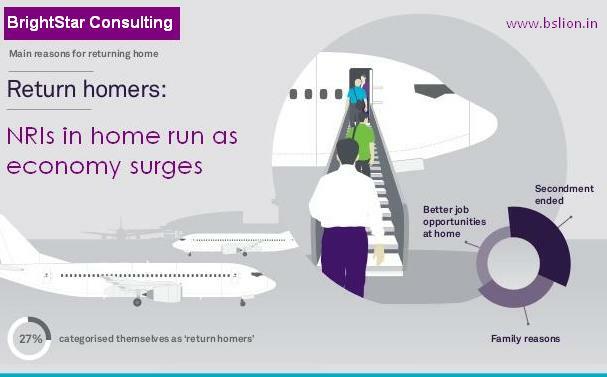 The trend of Indians returning from abroad to work here has picked up pace with the recovery in the country’s economy. Counter intuitively this is even as the monetary benefit that these executives could expect to earn has reduced over the last few years. The gap in premium between what the managers would have expected, say, three years back and now has nearly halved, say hiring experts. However, the reasons for the homing pigeons coming back to their lofts are quite similar — family matters and better job prospects. Please read an interesting article published in TOI newspaper today i.e. 27/Mar. If you are an experienced Oracle/SAP ERP, EPM, BI professional who lived off the shores for a while and would like to return home – we have terrific opportunities for you. Opportunities span Development (Individual / Lead Roles), Service Delivery, Program Management, PreSales and more. In fact all specializations in ERP, EPM, BI & Analytics welcome. SAP Business All-in-One is a brand umbrella for approximately 700 preconfigured, industry-specific versions of major parts of SAP’s Business Suite (mainly ERP, CRM and supplier relationship management [SRM]) that are built, sold, implemented and supported by approximately 1,000 SAP partners. Together, these versions cover virtually every product-centric industry. Each solution provides business process documentation that includes feature set descriptions, process flow diagrams and step-by-step user guides. This approach now forms the basis for SAP’s Rapid Deployment Solutions (RDS), many of which can be deployed on top of a Business All-in-One instance. Because they are derived from the SAP Business Suite, most of the technology and application enhancements (such as Hana and Fiori) become available for Business All-in-One solutions, although sometimes with a certain time lapse that is used by the partners to uplift their extensions to the latest baseline. Gartner estimates that total software revenue for SAP’s ERP business grew 3% in 2013 (see “Market Share: All Software Markets, Worldwide, 2013”), with much of the aggregate growth coming from cloud services, especially from SAP’s SuccessFactors business. SAP’s on-premises ERP is believed to have experienced a decline as customers start to favor SAP’s cloud products, as well as the still early maturity and ramp up of Business Suite on Hana where we see some customer interest, but also caution to assess customer benefits and lessons learned from early adopters. Like many other SAP solutions, SAP Business All-in-One (the current release is based on Enhancement Package 7 [EHP 7]) is being migrated to SAP Hana. SAP Business All-in-One now supports three database options from SAP (Sybase Adaptive Server Enterprise [ASE], Hana and MaxDB), as well as Microsoft SQL Server, IBM DB2 and Oracle. All 55 country baselines are technically upgraded to EHP 7, and approximately half of the 200 best-practice processes that make up SAP Business All-in-One are now supporting the Hana in-memory DBMS (see “The Primary Use and Business Cases for SAP Hana Solutions”). Selected transactions are optimized to make use of Hana’s in-memory features, either by switches within the transaction or by dedicated transactions. Subsequently, industry packages, country localizations, further transactions and reports, user interfaces based on Fiori are being delivered. However, of the four Fiori app types, only the transactional tasks run on a non-Hana environment, while the analytical dashboards, factsheets and the Smart Business Cockpits require Hana. Business All-in-One on Hana is still very new, and, as a result, not all references that Gartner spoke with actually used one of the SAP Business All-in-One versions. Other initiatives around Business All-in-One deliver additional RDS content and data visualization tools like SAP Lumira. The first steps toward simplifying the data model by removing aggregate tables and fields are being taken, but it is too early to see a decrease of the application’s complexity, which continues to be a concern expressed by users. The same is true for the various initiatives to improve the user experience to address customers’ comments about a lack of usability, for example, Fiori or Screen Personas. SAP continues to be the leading ERP solution vendor, both in market perception and in market share (see “Market Snapshot: ERP Software, Worldwide, 2014”). However, it not as undisputed in the midmarket because of complexity and cost. Its Business All-in-One solution portfolio enjoys good adoption among midmarket customers, mainly those in the upper midmarket and lower enterprise segments. SAP’s vision for exploiting in-memory capabilities is strong, and it has lately started initiatives such as Fiori and Screen Personas, although these only cover parts of the very broad application. Recent announcements to simplify licensing and pricing are promising for midmarket companies that cannot invest in expansive vendor management and sourcing capabilities. Taken together, these factors confirm SAP Business All-in-One’s position as a Leader in this Magic Quadrant. The SAP Business Suite, which forms the basis for the various SAP Business All-in-One solutions, is the most scalable and global ERP solution. Once the initial implementation of a specific Business All-in-One version is completed, a vast number of service delivery partners can be engaged to further deploy and optimize the solution. The best-practice template approach of Business All-in-One forms the basis for SAP’s growing portfolio of RDS bundles, many of which can be used to expand the functional coverage of All-in-One. However, as with all rapid implementation methods, customers must carefully analyze if the predefined processes offer the best solution for their business needs. SAP, through acquisitions, offers strong solutions such as SuccessFactors for HR, Ariba for procurement and hybris for e-commerce, each of which is classified by Gartner as a leading solution in its domain. Midmarket companies need to carefully check if these solutions are fit for their purposes. SAP’s investment in Hana in-memory technology will, over time, provide visionary planning and predictive analytics capabilities to Business All-in-One customers. Although the preconfigured nature of SAP Business All-in-One makes the first steps in an implementation easier, the concerns raised by SAP Business Suite’s customers about total cost of ownership, complexity of the entire solution, lack of user friendliness and flexibility in many parts of the system are also true for a Business All-in-One deployment. The many moving parts in SAP’s portfolio create many complex dependencies. Most Fiori parts require Hana, the migration to the Hana IMDBMS itself requires being on certain Enhancement Packages (EHP 7 at least). Customers should not attempt to do some of these tasks in parallel, as that can significantly increase the effort transporting and testing changes. The licensing options for some of the new features, like Hana and Fiori, were reported to be very complex. Customers should expect announcements by SAP executives regarding simplification of these options. Also, they should build terms into their contracts that allow for refunds of acquired products when conditions change, like the recent move to offering Fiori at no additional cost. Because of the newness of most Hana-based initiatives, companies should check the level of real-life experience of consulting partners. Transactions optimized for Hana do not always work as before, and, in some cases, have to be replaced by others, which makes additional testing necessary. Sizing hardware can be especially challenging, and, when in doubt, hardware should be sized generously, even if that will drive cost further up. A number of strategy changes make it difficult for companies to build consistent long-term road maps for their SAP environment. They need to be prepared to cope with short-term changes, for example, by adopting shorter implementation and deployment cycles.